How gorgeous has the weather been today?! I'd like to say these photos were taken today but they were actually taken a few weeks ago and I've been meaning to put them up for ages. My laptop broke a couple of weeks ago which kind of messed everything up completely regarding my blog etc., and I was so worried I would lose all my photos and documents but thankfully my wonderful boyfriend came to the rescue and fixed it all - phew! I was sent this gorgeous top from Drop Dead Clothing a little while ago. I absolutely love it - it's two of my favourite colours, lilac and pink, and I'm pretty sure I will be wearing it to death (geddit?!) over the summer as I love it so much. 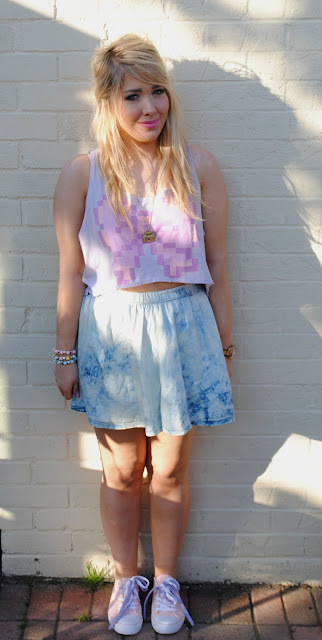 I paired it with my acid wash denim skirt from Primark and my cute Converse-esque trainers. Apologies for the slightly wonky photos - this is what you get when you have a tall boyfriend taking the picture! I have to say a massive sorry for not blogging much over the last few weeks, like I said my laptop died on me and I also got a new job so everything has been a bit hectic! I'm getting organised now though so blogging shall resume from now on! I almost forgot to mention - I took part in the Zest Challenge at the weekend and it was AMAZING. I will be doing a proper blog about it soon but just wanted to say a massive thanks to Alpro for inviting me to get involved, and I completely recommend doing it to anyone thinking about it!